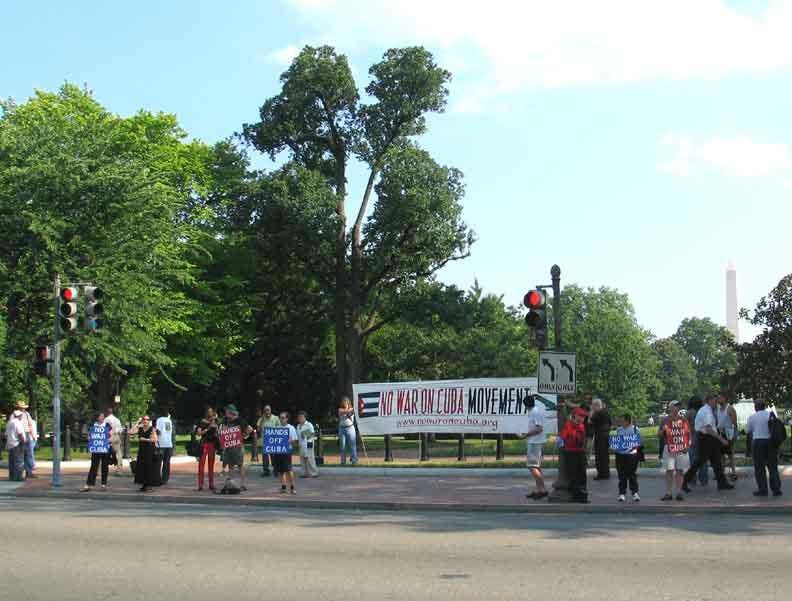 We demonstrated in front of the Washington, DC Cuban Interests Section, not only to show solidarity with Cuba, to protest US government attacks and threats on Cuba, but also to prevent the right wing Miami Cubans from insulting or attacking the Cubans in the Interests Section. One of our success that day was that no national TV could highlight the right wing Cubans demonstration - because if they had, they would have had to show us in front and our rebuttal to the US propaganda couldn't have been hidden! Report on this action. 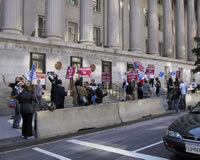 In front of the US Treasury Building, to protest US government plans to attack Cuba and further restrict travel, trade and people to people exchanges between Cubans and Americans. Despite the hot, muggy weather over 200 people packed the All Souls Unitarian Church in Wash., DC on June 24th to hear 5 panelists speak on US-Cuba relations. 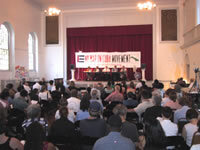 The No War on Cuba Movement (NWC) sponsored the Town Hall meeting to raise community awareness about US aggression against Cuba in the past and at present. WPFW radio station (FM 89.3) taped the event and broadcast it later that evening. Reports on this event. 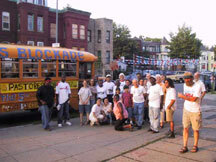 Pastors for Peace bus Caravan to Cuba stops to meet supporters `in Washington, DC at the new Mawonaj Cafe, 624 T Street, NW. on 7/3/03. 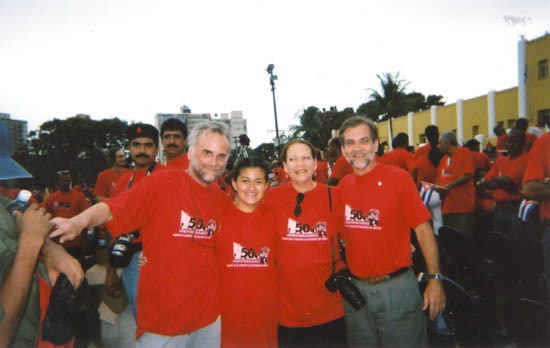 In the summer of 2003, many NWC members visited Cuba as part of peace, support, solidarity and friendship delegations. 50th Anniversary of the revolutionary attacks on the Moncada and Bayamo Garrisons in Cuba. 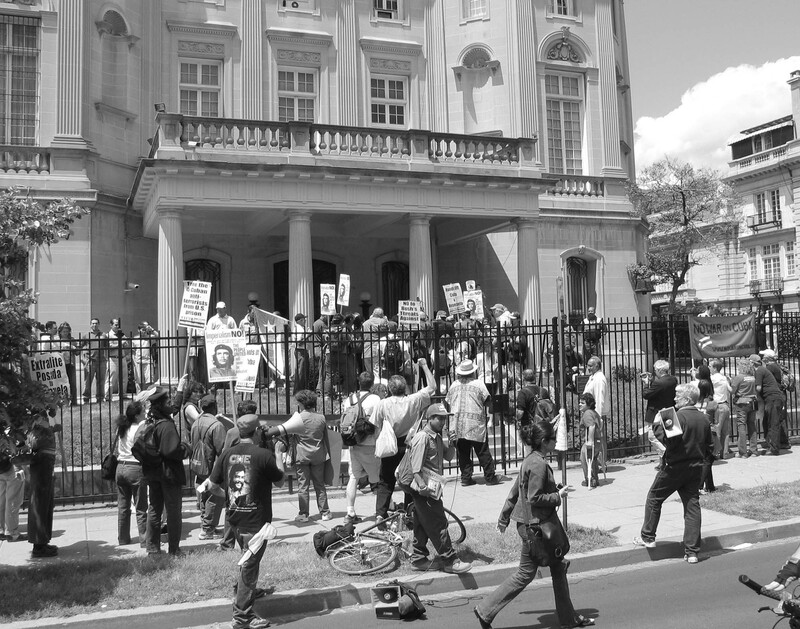 Demonstration Monday 5-24-2004,at Lafayette Park, 1600 Pennsylvania Ave, NW Washington DC. against President Bush's use of the "Commission for Assistance to Free Cuba," the latest attack on the sovereignty of Cuba. Leaflet in PDF format. At the 61st session of the UN Commission on Human Rights, the US government conspired to pass a resolution against Cuba. However there is no basis to condemn Cuba on the issue of human rights violations because their record on respecting and upholding basic human rights is acknowledged world wide as an international model. 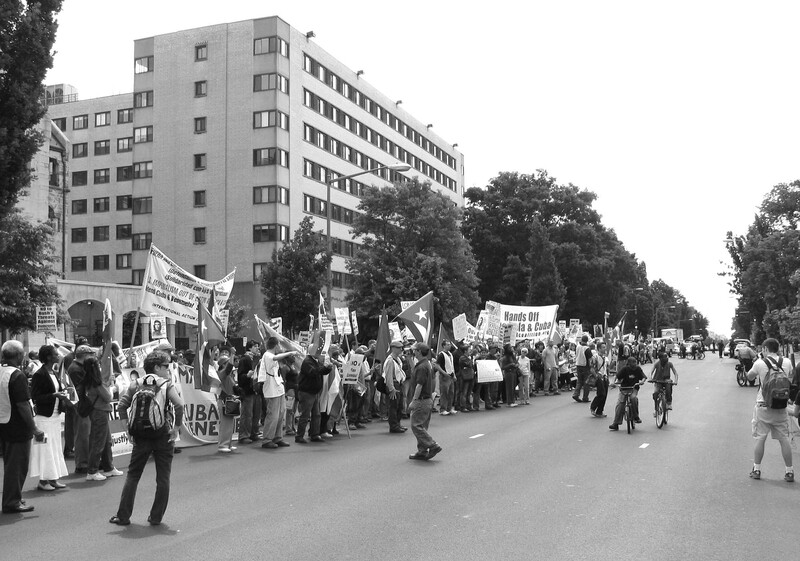 Given the United States' belligerent stance towards many countries, we strongly believe that any human rights resolution passed in Geneva could be used to justify increased aggression against Cuba. Rather the Commission must represent every United Nations member State and ensure respect for the rights of all men and women worldwide. Significantly, in last year’s sessions, it was impossible to evaluate or debate the atrocious violations of human rights in U.S. prisons in Abuh Ghraib and Guantanamo. Don’t allow the UN Commission to be used to legitimize the Bush administration’s aggressive policy against the poor of the world! Blocking the Right Wing! 2-25-06 A CALL TO ACTION! No War on Cuba along with Alliance for Global Justice, A-APRP, Pan-African Roots, Pastors for Peace, and other organizations and individuals said "NO!" 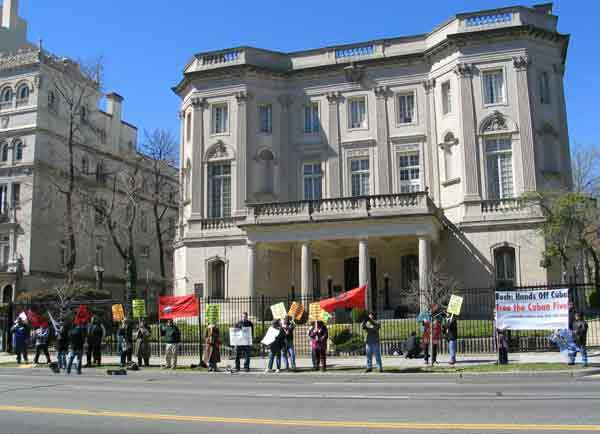 to the latest provocations against Cuba and successfully kept a right wing group "The Cuban Memorial Committee" from both the Cuban Interest Section and the Consulate! This group, a part of the US government’s plan to attack and overthrow the government and revolutionary gains of Cuba had planned to protest what they allege to be human rights abuses in Cuba. We see this and other recent provocations as acts of desperation in view of the fact that the extremist anti-Cuban right-wing community will soon loose their most loyal support; The federal and state administrations of the Bush's. Jeb Bush's term will be over in a few months and his little-big brother in the White House will be fairly close behind him. Right-wing extremist Cuban-Americans are desperate to make the US government "deal with Castro" now before they are looking at a less accommodating administration. Blocking the Right Wing! 3-18-06 Again! 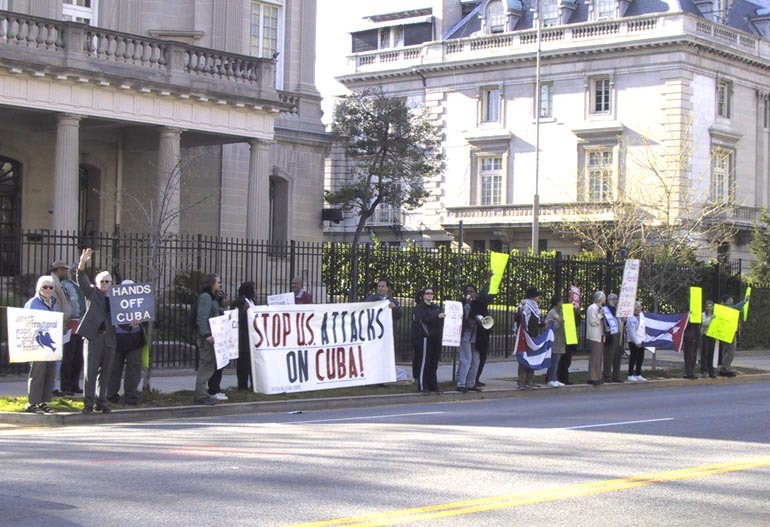 We got a notice that three right wing Cuban groups called a big protest at the Cuban Interests Section in DC and around the world on the 3rd anniversary of the 2003 arrests of the so-called Cuban dissidents, who Cuba jailed as paid agents of the US government. In spite of shortness of time, and other major pre-scheduled events, we mustered over 60 people in a few hours and these three right wing groups with all their apparent bluster and financial backing, brought out a total of 8 people! 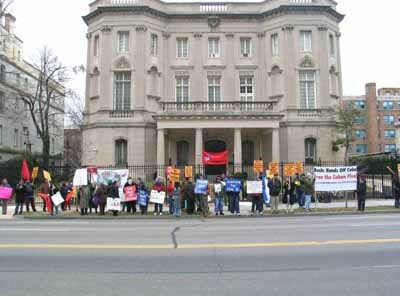 Again we kept them from both the front of the Consulate and the Interests Section! No War on Cuba along with Alliance for Global Justice, A-APRP, Pan-African Roots, Pastors for Peace, and other organizations and individuals successfully said "NO! 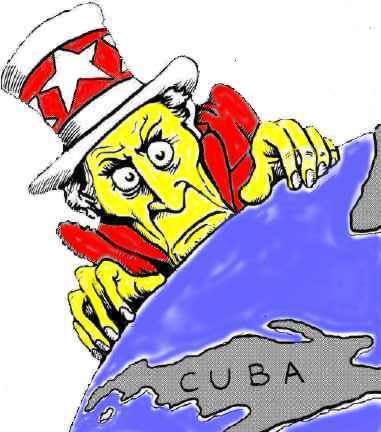 "again to the latest provocations against Cuba. This appears to be part of an escalation of the US government's effort to build up to its intended launching of new offensives against Cuba! We gathered at Malcolm X Park, 15th St. & Euclid NW, then Marched first to the Cuban Interests Section to show out support and then marched off to Lafayette Park for a Rally at 2 PM in front of the White House.